Fifteen years ago, superhero movies were dead. Batman and Robin had all but killed them. We were two years away from Sam Raimi’s Spider-Man, five from Christopher Nolan’s Batman Begins and eight from the Marvel Cinematic Universe. So when audiences sat down for Unbreakable, no one was ready. I’ll never forget the first time I saw the movie. I just thought I was seeing the next thriller from M. Night Shyamalan, the filmmaker behind The Sixth Sense. The trailers hadn’t given away much. Then, the lights went down and the film started with this. Wait, what? What the hell does this have to do with this movie? I was very confused, but very intrigued and over the course of the next 107 minutes, I’d fall in love with the superhero genre in way that would take most people the better part of a decade. Released in 2000, M. Night Shyamalan’s Unbreakable is the story of two men, polar opposites, who are struggling to figure out their purpose in life. One, David Dunn (Bruce Willis) seemingly can’t be hurt. Another, Elijah Price (Samuel L. Jackson) is incredibly brittle. Neither feels they have a place in the world–and over the course of the film, we realize each’s existence is linked to one another. And those links are hinted at by those comic book stats at the beginning of the film. Years before it was en vogue, Shyamalan gave us a grounded superhero movie. A movie with simple, almost logical explanations of how comic books are actually a kind of modern-hieroglyphic, exaggerated for entertainment, telling tales of extraordinary men and women who actually existed in the past. Price believes that Dunn is one of these people, and as the film unfolds, we believe that too. We also realize that even being “unbreakable” doesn’t mean you’re perfect. Dunn is in a rocky marriage, keeps his son at a distance, and is more emotionally vulnerable than we’d ever thought a hero could be. That’s one of the many ways Shyamalan keeps the film from going off the rails, by showing these characters not just at their best, but at their worst too. The whole movie also has a softness to it. It feels minor, the dialogue delivered in whispers, the camera gently floating around, always set to the soft piano of James Newton Howard’s score. That tone, the prevalent one in the film, allows for some incredibly big crescendos, both in character development and action. A scene of David lifting weights with his son builds at such a wonderful pitch you want to cheer at the end. Things then build to a rousing climax that somehow says everything without saying a word. It doesn’t hurt that Newton Howard’s score is one of the best and most underrated in the past several decades. I dare you to watch this movie and not whistle this on the way out. That’s not to say the film isn’t without its flaws. From shot one, Shyamalan is in full “filmmaker” mode, using reflections, moving cameras, long takes and more to tell his story. There’s a lot of impressive stuff here, but it becomes almost distracting at times. We get it. You’re cinema educated. The script also has some cringe-inducing lines peppered throughout. “I heard this one has a surprise ending.” Oh, really? “No shooting friends, Joseph.” Oof. Still, I think that’s all forgivable because of what Shyamalan ultimately accomplished and when he did it. These days, superhero movies are all about keeping it real. Grounded. Believable. Well, David Dunn and Elijah Price are the quintessential grounded comic book characters. They live in our world, know what we know, and don’t need to put on a special costume to do good–or evil–in our world. The film achieves an absolutely perfect blend of superhero mythology and reality, a balance many movies and television shows still try to achieve today. 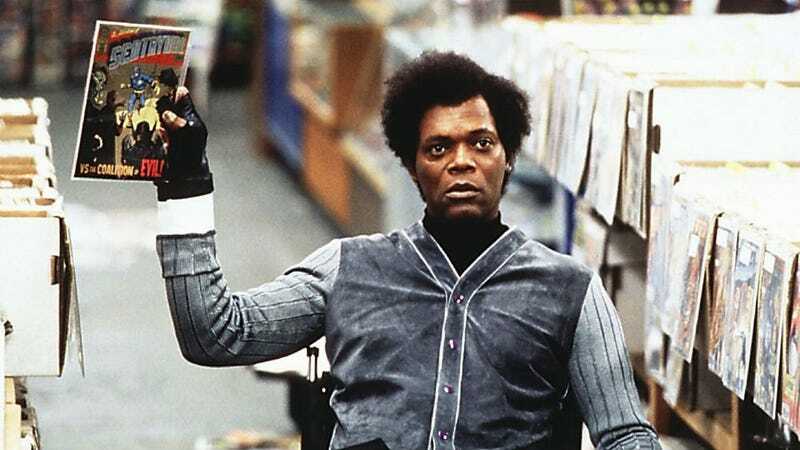 And yet, when people talk about the best modern superhero movies, Unbreakable never gets brought up. Is it because this is an original story not based on a comic book property? Was the film simply too ahead of its time? The stigma of Shyamalan? Probably all of those things. But it’s undeniably one of the precursors to the world we’re living in today, and because of that, the film is as great as ever. If you’ve never seen Unbreakable, watch it immediately. If you haven’t seen it in a while, watch it again. Sure it’s got one of those wink-wink, M. Night endings, but unlike some of the others, this one actually enriches not just the plot, but the characters and theme of the movie as well. There has long been talk about a sequel–and while I’d be first in line for it, I’m fine that it’s never happened. I just wish more people would talk about Unbreakable, simply so I could selfishly buy a David or Elijah action figure. Unbreakable is one of those movies I want to be reminded about again and again.